More than 300 runners leave the start line at the 6th annual Heart and Sole 5K race at Eldora Speedway. 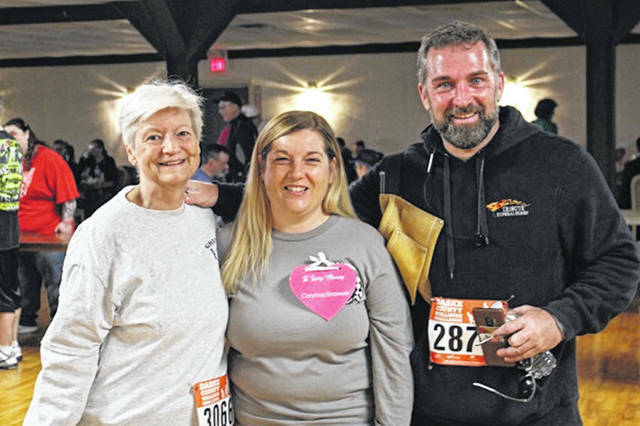 L-R, Peggy Foutz, Kristi Strawser, Executive Director at State of the Heart Care and Eric Fee, owner of Tribute Funeral Homes assist with the 6th annual Heart and Sole 5K race. Two young boys compete in the 6th annual Heart and Sole 5K race at Eldora Speedway. Tracy Moore, one of 312 participants runs in the 6th annual Heart and Sole 5k race at Eldora Speedway. The traveling Pancake Trophy was won by Craig Riethman of F45 Training at the Heart and Sole 5K race at Eldora Speedway. Pancakes are served to Heart and Sole 5K race participants in the Eldora Ballroom. Runners enter the Eldora Speedway spectator stands at the 6th annual Heart and Sole 5K race at Rossburg. 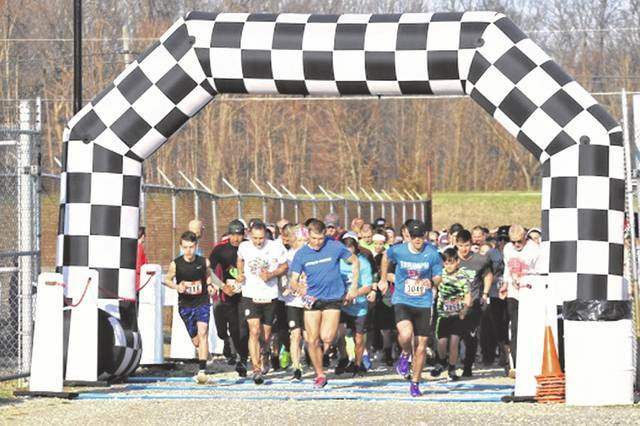 ROSSBURG – The 6th annual Heart and Sole 5K race at Eldora Speedway saw a record number of entrants participate in the Saturday morning event. Kristi Strawser, Executive Director at State of the Heart Care opened the day’s events by singing the National Anthem. Tribute Funeral Homes was the Presenting Sponsor of the race that saw 312 entrants join the race. 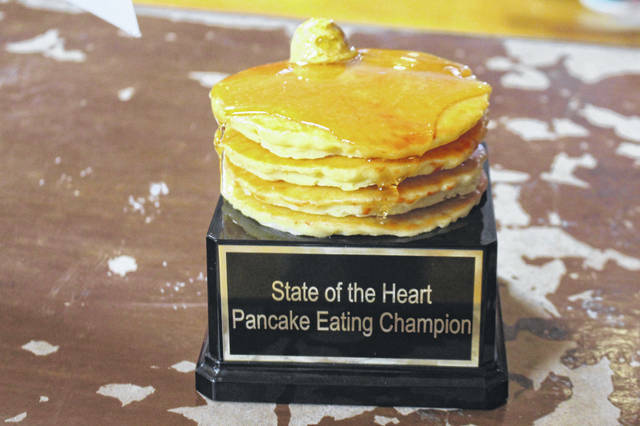 A first for the annual event was a pancake eating contest sponsored by Drew AG Transport, Inc. with the winner earning a traveling pancake trophy. Heading up the 5K event was first year race director Erica Wood. Pancake Breakfast Sponsor: Drew AG Transport, Inc.
https://www.dailyadvocate.com/wp-content/uploads/sites/34/2019/04/web1_8-inch-5K.jpgMore than 300 runners leave the start line at the 6th annual Heart and Sole 5K race at Eldora Speedway. https://www.dailyadvocate.com/wp-content/uploads/sites/34/2019/04/web1_8-inch-Eric-Fee.jpgL-R, Peggy Foutz, Kristi Strawser, Executive Director at State of the Heart Care and Eric Fee, owner of Tribute Funeral Homes assist with the 6th annual Heart and Sole 5K race. 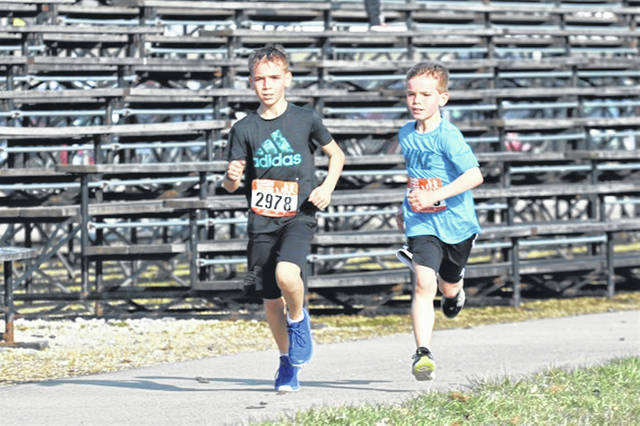 https://www.dailyadvocate.com/wp-content/uploads/sites/34/2019/04/web1_8-inch-Kids.jpgTwo young boys compete in the 6th annual Heart and Sole 5K race at Eldora Speedway. 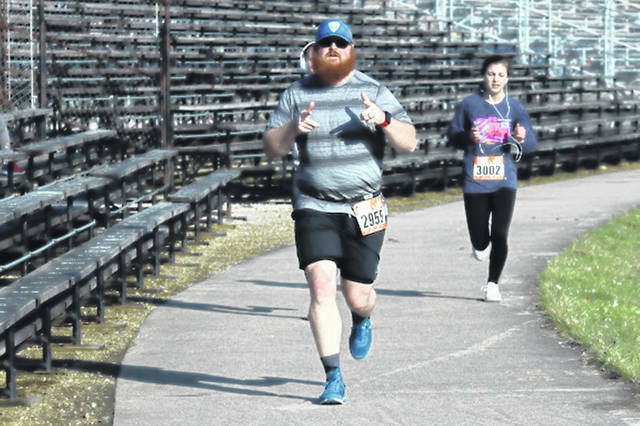 https://www.dailyadvocate.com/wp-content/uploads/sites/34/2019/04/web1_8-inch-Moore.jpgTracy Moore, one of 312 participants runs in the 6th annual Heart and Sole 5k race at Eldora Speedway. https://www.dailyadvocate.com/wp-content/uploads/sites/34/2019/04/web1_8-Inch-Pancake-Trophy.jpgThe traveling Pancake Trophy was won by Craig Riethman of F45 Training at the Heart and Sole 5K race at Eldora Speedway. 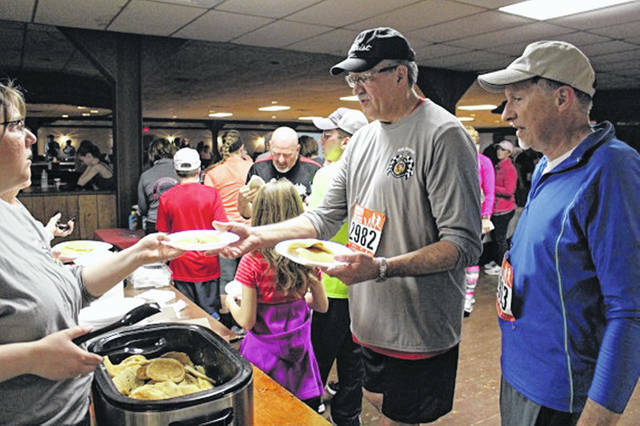 https://www.dailyadvocate.com/wp-content/uploads/sites/34/2019/04/web1_8-inch-pancakes.jpgPancakes are served to Heart and Sole 5K race participants in the Eldora Ballroom. 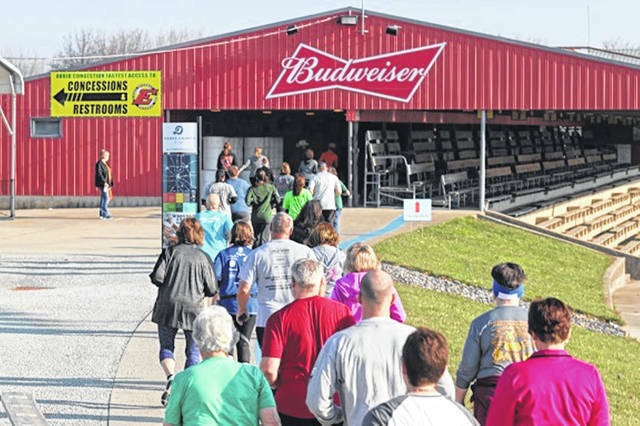 https://www.dailyadvocate.com/wp-content/uploads/sites/34/2019/04/web1_8-Inch-race.jpgRunners enter the Eldora Speedway spectator stands at the 6th annual Heart and Sole 5K race at Rossburg.